Happy Small Business Saturday! For Giveaway #2 ~ we have 5 fun bundles from HELP! Remedies. Consider them holiday survival packs… a little something for random emergencies, perfect to toss in the purse or car when bouncing all over even! Or, perhaps they are exactly what you need for that accident prone friend’s stocking? Remember that press kit and board book they sent over before? Well, inspired by that, this super kit will have you covered through minimalist chemicals and packaging ~ eliminating eccessive dyes, unrecyclables, and more while still beautifully designed (down to the ‘help’ imprinted on the pills!). For a chance to win one of the 5 Help! Bundles (including ‘Help, I’ve Cut Myself’, ‘Help, I have an Aching Body’, ‘Help, I have a Blister’, ‘Help, I have a Headache’, and ‘Help, I have a Stuffy Nose’) from Help Remedies, leave a comment with what you could use help with this holiday season before midnight PST on Dec 1, 2011 and we’ll notify the winners by email! Check out details of what’s included on the next page! CONGRATS to our winners Tyler from Lake Stevens, WA, Tamar from Los Angeles, CA, Taryn from Chapel Hill, Queensland, Veronica from Singapore, and Nick from Ellsworth ,ME! For a chance to win one of the 5 Help! Bundles (including ‘Help, I’ve Cut Myself’, ‘Help, I have an Aching Body’, ‘Help, I have a Blister’, ‘Help, I have a Headache’, and ‘Help, I have a Stuffy Nose’) from Help Remedies, leave a comment with what you could use help with this holiday season before midnight PST on Dec 1, 2011 and we’ll notify the winners by email! I could definitely use help cleaning up for the holidays! My house is a mess and it’s too cold to get up. I could use these after I spend hours shoveling snow off my driveway at home this winter. Recent layoffs have left me with more work than usual, as I come on on my last few courses toward my degree, and 15 year old daughter has her first boyfriend, and my son will be spending Christmas with his fellow Marines this this year…pick one - just HELP! I could use some help remembering that the holidays are about more than stuff, um, even though I’m submitting this in the hopes of getting some for free. This holiday season I could use help with creating new, fun ideas for presents! Don’t want the stale same olds that everyone gives and receives every year. This holiday season, I could use help passing my classes. Help! I’m a 4th grade teacher with a cough/sore throat that doesn’t seem to stop all winter long! The motivation to continue medschool. I wish for the right perspective and mindset to be able to answer the doubt with regards to med. I need some help making it through this whole “applying to grad school, working two part time jobs, and being a full-time student” thing. I could use some help herding cats…..keeping the animals out of the tree, the husbands work schedule settled and the holiday schedule so that I wasn’t trying to be ten places at once on every weekend. I need help wrapping the gifts. I’m terrible at it! Help! I have a hangover on a Wednesday. I could use help this holiday season explaining to my family that I have neither a sleep disorder or serious depression, but simply that I am in law school, when I spend my entire visit home in my pajamas watching holiday themed rom coms. I could use this for an evening out on New Year’s and the following day to the whole week. Bandages-papercut from a receipt, blister-from the heels I’m trying to wear in that nite, headache-hangover from New Year’s Eve, stuffing nose and aching body from the next the nite before being out so late that I can use this for my cold. I could use help finishing a crafting project for a friend - a baby blanket for her holiday baby! I could use help decorating my house for Christmas for the FIRST time. I could use help with all of the design projects that have been suddenly dropped on my desk. It seems like December is the month for everyone to ask for work. Sheesh! Keeping sane with all the traveling and family and different christmas’ I am going to have with many different families. I could use help with EVERYTHING! Not only am I dealing with all things holiday, but I’m planning a wedding at the same time! Cue the headache, backache, blisters…you name it! I could use help doing my christmas shop. I’ve not started yet. Winning this gift would help me as I’ll then have at least one present to give to a lucky person at christmas. It would help remind me to keep the holiday spirit up — to remind me to strive to think of others no matter how tired or busy I am. I could use a little technical help on converting old video tapes of my dad into a digital format so we could view some wonderful memories while he was still alive during the holidays. help with the in-laws : they make one of those ? I could use help getting one of these nifty little help! Bundles for free! I would give these to my slight hypochondriac of a friend. She’s addicted to both art and painkillers & would love these little guys. I would use these as gift for some of my family member. thanks! Help with christmas shopping might be beyond these Help! Bundles. I could use help handling family… . Seeing as how i get sick every holiday season i could use some HELP! getting over the cold so i can back to lying not he beach and stuffing my face! This would be perfect for my mom. She’s always carrying little ziploc bags full of different pills and bandaids. I could use help getting pregnant! I am undergoing IVF treatment this December and if everything goes alright I will be pregnant by Christmas! I could use some help getting my portfolio ready for graduation. I need help with wedding planning.. I’m starting to become a bridezilla. I could use some help with hanging Christmas lights on my new house! I could use help keeping my family and relatives sane! I could also use some help getting out of LAX on Christmas eve with my pup in hand on time! Definitely… my back. Carrying gifts for all the family… hmm. Maybe something for the headache too! haha. I need help taking care of myself as opposed to everyone else in my life. Also, every since my roommate and I saw these in stores we’ve been saying “Help, I need help!” whenever we need something. It’s very effective. I could use help finding a new design job! i think i ‘ll can use all the remedies in this way. or just gettin’ drunk. i will always drunk during my holiday, so i will have many headaches. but when i am drunk i usually fall, so i think i’ll cut myself and hurt my body. usually i get drunk during parties, where i wear high-heeled shoes without collant or socks. so i think i’ll have a big cold and big blisters on my feet. Help! I need a remedy for my broken heart! I could use help getting over the holiday blues while spending it abroad, away from family and friends. I need some serious help cleaning my house and organizing everything before family starts arriving! Help! I need help thinking about what to make this year for gifts for friends and family! Christmas and finals without a stuffy nose or a headache sounds fantastic! Help! I’m in dire need of assistance managing several festive events and Birthday’s (and myself). I need help to not eat all the pastries at parties, work, and home. I could use help with the dinner for christmas! I could use some help with the headaches my family has caused me for overcooking the turkey! As a baker, I could really use some help picking up the loads of groceries I’ll be needing this holiday season! I cook my first real christmass dinner! I could use some helping hands. I could use some help with html. Bleh! I will need this kid for celebrating the New Year cause Im gonna really enjoy this hollidays after all the works for school! I need help with buying Christmas presents. Who would have known getting married would mean more presents during the holidays?!? I need help getting my house ready to move in January. Help I’ve got a papercut from giftwrapping! Help, I have eaten yellow snow. Need help bringing home my Christmas tree! I could DEFINATELY use help with training my three rescue dogs. Help! I’m building Santa a new sled! These Help Remedies could surely help me! 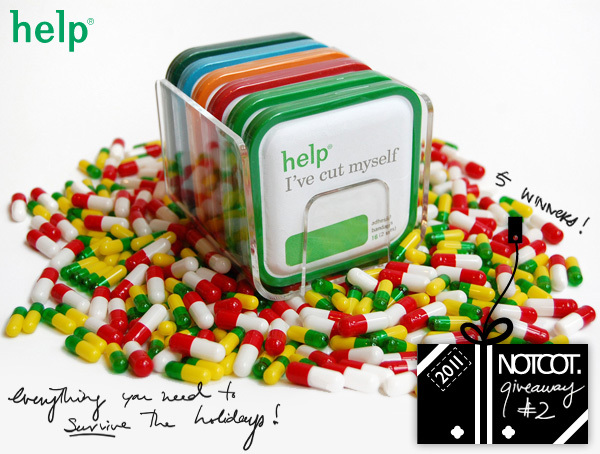 ‘Help, I’ve Cut Myself’: Can help me with the holiday card paper cuts I am bound to have! ‘Help, I have an Aching Body’: Can help me with the soreness I will have after sleeping in my childhood twin bed at my mom’s house when I visit her during Christmas! 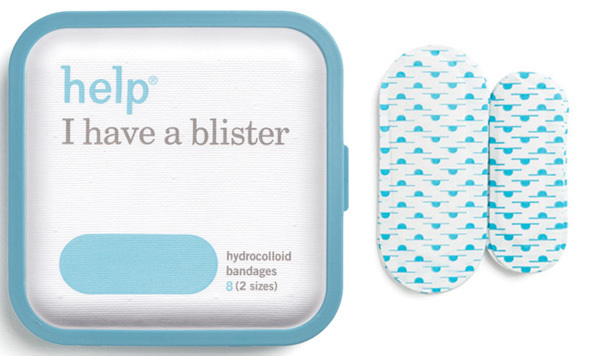 ‘Help, I have a Blister’: Can help me after I wear 5 inch heels to my holiday work party! 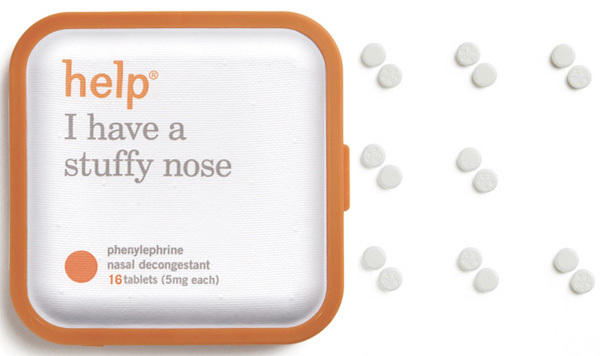 and ‘Help, I have a Stuffy Nose: Can help me with the cold I will have after hopefully having a very cold and very white Christmas! I could use some help in finding a job! I’m afraid the ibuprofen and acetaminophen included in this giveaway, may not help me at all! I could use help with balancing my work and relationship. I’m only 23. It’s really hard! Being a comic artist requires a lot of creative thinking. I could use some help in that department any day. I would love some help creating the perfect Christmas stockings for my family. We lost ours this year due to flooding and I ended up volunteering to create new ones to replace the 25 yr old ones my mom sewed - major responsibility! I need help with becoming the “best gift giver” this year… I want my friends and family to think “she’s the best gift giver” whenever I give a gift… I always try for really creative gifts but can never really find them in stores. I realllly need help picking my ladie a greeeat present! I need help fitting all the stuff for camping with three people and a baby into the car. I could use some help dealing with my family during the holidays. So cliche, I know, but unfortunately so true. My husband would would be staring down our 2 year old girl for the opportunity to play ‘house’ as this beautiful piece of art, architecture, and toy would tickle anyone’s imagination! I need help baking and shopping!! I need help planning my holiday menus! I could use help coming up with excuses to avoid visiting family during the holidays. Help! I need Santa’s elves to help me (all year round). I could use some help thinking of cost effective ways to get every one of my family and friends a nice and thoughtful gift for the holidays. This one would be a good one for my new boyfriend, a nursing student! I could use help in figuring out how to fit 17 people in a two bedroom apartment this Christmas. help! i need more time in the day. less day job, more paint! slipping on the floor in my socks. I need help with stress levels - but I also get a lot of small cuts too…. Please help me pass all my classes! I could use help with remembering to focus on the important part of Christmas - faith, family and fun times! I need help with all of my final projects for school! i need help cooking all these dinners! I’m going to need help with a hangover or two. I need help figuring out what to get everyone on my list. Please… help. me. If I could take a pill to make me smile through listening and re-listening to dusty family anecdotes, it would be amazeballs. I could use help with gift ideas and making 2012 better than 2011.. I need help controlling/predicting the weather the night I drive through the mountains to spend Christmas with my fiance’s family. Please no snow, please now snow, pleasenosnow! Last Year my buddies and I went skiing/snowboarding here in Canada. It was a rainy winter and there was a layer of ice over the mountains but it was all topped with a layer of light fresh snow. While it is almost needless to say, about 7 of 10 of us were out of commission by day one. I had it worst with a swollen knee the size of an orange and I’ve been trying to revive that knee since my “accident”. This year, I am going to head back, but I’d like to be prepared! totally useful when visiting my little nephews and nieces! “Help! I need somebody, Help! not just anybody…Help me if you can, I’m feeling down.”—They could probably use these lines too. Put some uplifting message written on a small piece of paper that fits inside a pill or perhaps, zoloft…Haha! I kid, I kid, Probably add candies or any sweets will do. I will be needing the one for the stuffy nose, headache and aching body coz tis the season to be jolly (which means drinking ice cold beer). I could use some help getting through my baby’s teething. I’d love help staying cool, calm and collected this holiday season. Okay … I already have the “cool” part down! I could use help when I wake up after christmas and the only pain I feel is champagne. I don’t know that these are the remedial medicines I’d choose for my trip to India, but it sounds like they’d help while I’m over there. Help! I have a headache for the twenty-eight hour flights. Help! I have blisters for my hikes over in Nepal. I could use help getting home to see my family this Christmas. The budget just might not allow for it this year. Happy Holidays! I could do with some help with my inlaws. Do Help! Remedies do heavy artillery or not? I need help finishing (or uninstalling) Skyrim. Organizing my stuff. I could really use a butler running around doing thousands of these minuscule tasks for me! Planning my engagement party for the end of December after the holiday season! I could use some fun between semesters! My list of things to do for fun keeps growing but I could always use more ideas! I need help Starting my business!!! the first year is so tough!!! I’m having a wisdom tooth pulled in december. ill trade you some -not as adorably packaged- vicodin. I could use some more time off to help with my sanity. I could use some help with money so I can buy better gifts for my parents. They deserve something good this year. I could use some intense help getting rid of the viral infection that is keeping me from christmas cookie baking. I could use help teaching my mother how to use her new smartphone! I’ll use them to help others. Isn’t that what the holidays are all about? I could use help with trying to make a dollar out of 99 cents. Why is there never enough money during Christmas???? help getting rid of my migraines. I could use some help at work since I am a social worker for adults with mental disabilities. Since accidents happen all the time, this would really prepare me for anything! I could use some help stringing up my lights. Will be going on vacation Christmas week and could use some HELP in the first aid department! I think I will need something for each pack just to get through picking out, putting up, and decorating the christmas tree! i will need help staying healthy this season. with two small kids in pre-school. the whole family is a sniveling mess. I could use help with finding a job this holiday season! I’m still in college and need to save up some money for graduate school =) Big dreams. Thank you for this offer NOTCOT! 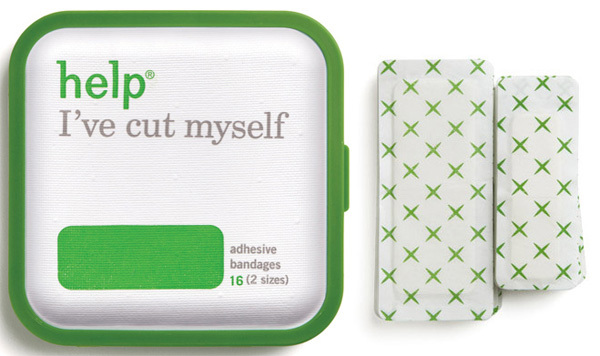 I’d use the “I’ve cut myself” during all times I’m using a X-Acto knife to cut foam boards. @_@ The price of presentation! haha. “I have a headache” would be perfect for all the late nights of thinking of concepts and finishing projects too. These Help! Remedies are perfect since their small and could easily fit into my purse or car. Thanks again for this offer! I could use it during the mad dash for Christmas presents. I’m bound to rush and cause an accident where “help” could be used well! My little office first-aid kit could use some of this HELP! help could help remind me and my friends that not only do we need it, but we are able to share it, especially during holiday season. It could help us believe that there’s still some warmth, and there’s still people who cares. I could use help with writing lesson plans for my 4th grade class! oof! I could use help with planning - so many things to do! I could use some help with my final projects for the semester and some ideas (and money) for Christmas gifts. I need help with three final papers! My semester is too rapidly coming to a close and I dread getting the necessary work done! Please Send Help! I could use some help meeting this huge deadline at work (and battling the headaches and associated paper cuts). Picture yourself on January 1st, 2012. You have a major hangover, a cut on your knee from when you tumbled down thanks to the blister your skyhigh heels caused and your nosy is runny because of the skimpy outfit you wore to the NYE party. All you need to get you through the day is your HELP kit. Pop a pill for the headache and one for the stuffy nose. Stick a bandage on the knee and protect that annoying blister with another one. HELP is there for the Holidays! I could use above pictured remedies to play wonderfully well designed practical jokes on my parents, who always are asking where the band-aids are, and the headache medicine, Imagine their surprise when they find these gems lying around the house, in the couch, or under their pillows! I could use some help convincing my boyfriend it’s time to move in together! I’m going to need help getting home this holiday season after university finishes but before the snow comes. The weather last year made travelling so difficult, and this year I’ve got much further to go ! I need something to help sooth the pain of my 2.5 hour commute to work everyday. HELP! It’s that time of the month again. HELP! It’s not time for a baby yet. HELP! I forgot to take my pills. Help! I’ve gotta write around 60 pages for finals before the holiday is over! I need help with paper cuts and bad breath. I need help dealing with all my extended family. Definitely could you a Help! Remedies kit for work. Let’s see there is potentially cutting myself on knife while cutting up body parts, the headache of the stress of New Years car accidents, and probably a stuffy nose along the way due to the crazy warm/cold weather in Oklahoma. I could use help finding time for everything I need to do, and especially with getting a job! Help! I need ideas for christmas gifts. a one year old daughter, both families converging for Christmas and potentially the bunny costume from A Christmas Story. Not sure why i’m even posting a comment. It should be fine. I could use A LOT of help moving out of our house (in a week) this holiday season! Going to need a ton of pain medication for the heavy lifting and time to take a deep breath for what’s to come! Gosh, help on some of my final exams would be fantastic. Help getting everything ready before my impromptu trip to visit my friend in Spain. I could use some help finding a quiet patch of mind to plant thoughts on. I could use help finishing my schoolwork before Christmas break! Help my family is trying to eat my dreams. Here in Brazil I have REAL headaches caused by the heat. I could use some help and these packages are soooooo cute. I need help getting a new wardrobe…because I just got in from having my convertible top sliced open and all of my clothes/shoes stolen I just had removed from storage yesterday. Awesome! I could use help not not be selfish! When I order online I keep throwing something “small” in for me. Selfish! I could use help finishing my homework and projects! I could use some help with figuring out how to study for my first big medical school final (Neurology) while staying sane and in the holiday spirit. And how to shop for people on my non-existant student budget. I could use some help finding a new house, long-term, for my growing family. Right now, I could really use one of these to help me get over my cold! HELP, I’ve burned the turkey! I could use help reviewing everything i just learned in year 1 of medical school well helping my mother recover from her bilateral radical mastectomy. and still successfully get the Christmas shopping and decorations done. Here’s to the challenge! Help! I have a newborn! Help! I’m watching a Will and Grace marathon and loving it! Wrapping presents all week for the extended family - then they’re all visiting over Xmas. 12 kids under 10. Help! I could use help answering the “so what will you do after you graduate?” question from every one of my family members. I need help for deadly missing my parents who are on the other side of the earth. Presents, packing, travel, in-laws… Wow. What couldn’t I use help with? I could use help keeping my Diabetic mother away from all of the sweets this Holiday Season. Maybe I can make her a sugar free cake or pie ? Or both ! Happy Holidays all !! I could do with Help in the form or large Plasters/Band Aids to cover my eyes from all the things I want this year! I need help figuring out an affordable, but creative and unique gift for my mom for Christmas! I need help celebrating my birthday! Actually my birthday is on the 24th. I’m also living by myself while my family lives miles away. So not only do I need help to celebrate the eve of Christmas but the Christmas day itself without feeling homesick. For when the kids get all sugared up like this morning. I need help wrapping all the presents!! I always need help trying to decide on the perfect gift for someone. NOTCOT is a huge source of inspiration for me. I could use help patching up little kids as they careen around the house during the holidays! help. I have an addiction to really cool packaging. Anxiety. Regrettably, holiday season is finals/paper season for grad students. I can use help on Dec. 24th while battling horde of like minded last minute shoppers for the very last ________ (fill in blank) that my son “must have”. I got a holiday 5k run coming up. I could definitely use some help! I could use some help making my Christmas Candy Collection of Bark as gifts for this year! i’ve been working too hard this year - my body needs some “aching” i think. I can always use adhesive bandages around the office. i could use some help finding a damn design job. I could use help with all of the headaches that are going to come from work travel in preparation for a huge event in January!